Is your kitchen covered in confetti-like bits of paper from last night’s scrapbooking session? Do you often look down in the middle of a meeting and discover you’re covered in a light dusting of glitter from your kids’ most recent art project? 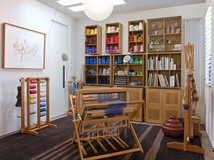 Or are you just looking for a quiet space in which to sew? If any of these scenarios sound like a page from your life, then it’s time to think about setting up a craft room. 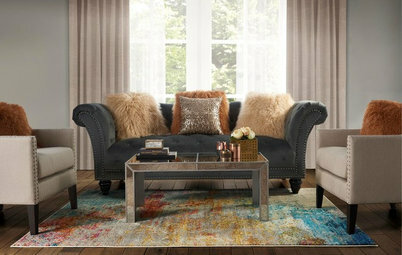 It doesn’t have to be anything fancy or even occupy an entire room. 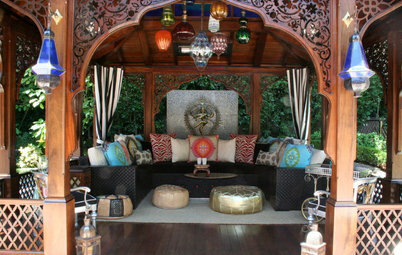 It would simply be a designated, well-organized space where you can create in peace. If that sounds like heaven to you, this ideabook can help. Whom to hire: If you have strong organizational skills and a good idea of what kind of workspace-to-storage ratio you’ll need, this is a project you can easily take on yourself. But if you’re like me and your closets perpetually look like a bomb went off in them, you might want to call for some professional help. If you’re dealing with a blank canvas, a design pro from a custom storage and organizing company can help you make the best use of your space. 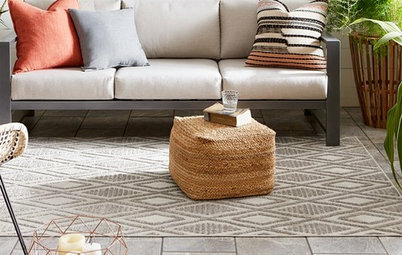 If you don’t have the desire or budget to fully design a space, a professional organizer can help you avoid getting lost in a pile of art paper or upholstery swatches. He or she can help you find a place for all of your precious supplies — even that messy pile of remnants you know will come in handy someday. 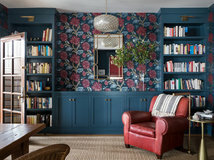 Project length: One day to organize, and one additional day if you’re working with a pro to install custom built-ins. If you’re doing this yourself, you might also consider spacing it out over a weekend, as you’ll likely spend several hours sourcing and purchasing the jars, boxes and organizers you’ll need to keep the space neat. 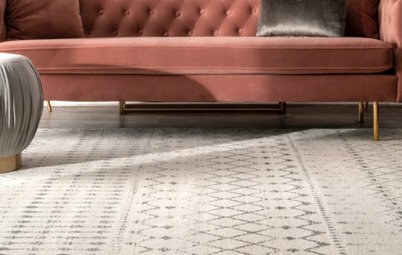 Cost range: It all depends on how many supplies you have, how much space you’re working with, and whether you want a built-in look. 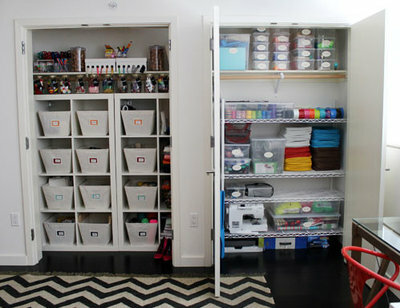 You might end up spending $100 for the right containers while organizing everything yourself, or you could spend up to $20,000 on a professionally designed space. 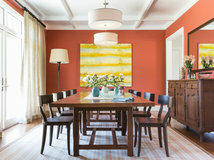 The homeowner whose space is pictured here spent about $3,200 in professional design and organizational services. Project considerations: You’ll need to start by considering two major factors: how much workspace you’ll need and how much stuff you have. Messis also warns that projects done as part of a large space — like a playroom or an office — often cost more, as the whole room needs to be redesigned to accommodate the craft space. 1. Consider your workspace. 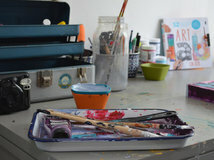 You’ll need a large, sturdy, easy-to-clean surface that enables you to spread out while you’re working on a project. 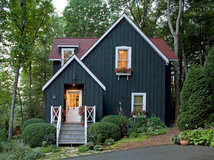 Consider not only the size of the room, but also the kinds of projects you like to take on. You’ll also need ample lighting. If things are looking a little dim, brighten them up with an LED desk or a floor lamp, or ask your pro for a custom solution. 2. Designate storage space. 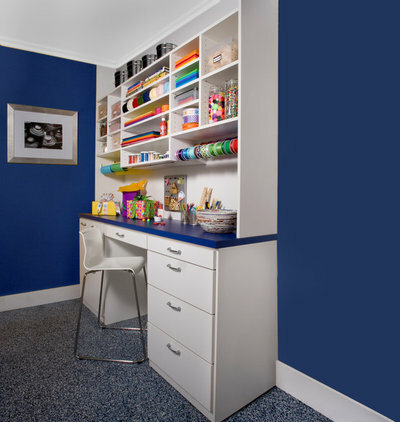 While a closet is the obvious place for hiding messes, not every space has enough storage. Neat Method‘s Heather Byrne suggests buying a small piece of furniture with cubbies, shelves or drawers if storage space is lacking. The key is to keep supplies accessible — ideally within arm’s reach of your work area. Messis suggests using a horizontal rod to hang wire, ribbons, sheets of paper and spooled supplies on. Also “incorporate ample space into the design to store flat sheets of paper, such as construction paper and drawing paper,” he says. He loves divided drawers for organizing small tools, and suggests making sure your shelves are adjustable to accommodate all sizes of jars and boxes. 3. Look at what you have. Perhaps you have six kinds of scissors or maybe hundreds of balls of yarn. Either way it’s smart to start organizing by type. 4. Choose and label containers. Once a home was found for each item, Neat Method created a list of organizational solutions to keep the space clutter free and easy to maintain. “We implemented labeled bins, jars, ribbon boxes and a few acrylic desktop organizers for everyday craft supplies to help streamline the crafting process,” says Byrne. She points out that these supplies don’t have to be expensive. Target, Cost Plus Word Market, The Container Store and The Organizing Store are some of her favorite sources for affordable supplies. 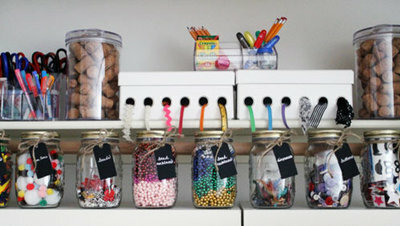 “There are also so many ways to creatively organize crafting supplies with items from around your house. 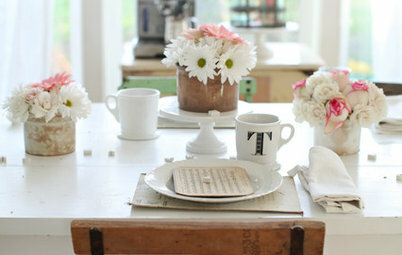 For example, use old jam jars instead of buying new ones,” Byrne suggests. I can't resist commenting about the person that lined their shelves with boxes--don't do this! The acid in the boxes will discolor your fabrics and weaken them. 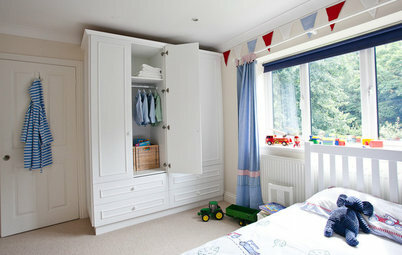 Store the fabrics directly on metal or plastic shelves, then drape with fabric like a cotton sheet to keep out the sun. Same goes for yarn. Similarly, use baskets, plastic, glass, or metal as organizers, not shoe boxes or other cardboard. My current favorite is custom made fabric baskets/boxes since I can make them to the size needed and with 100% cotton fabrics that match my craft room. If you have wooden shelves, make sure that they are sealed with varnish, polyurethane, paint, or something similar so that the acids in the wood do not destroy your fabric. I have heard the cardboard box issue addressed in other articles. For over 30 years, I have saved fabrics in regular "copy paper boxes" with no staining or problems, at all. In fact, since I am cheap (some say thrifty, but I know the truth), my husband made framework of plywood to create shelf space. He then added adjustable shelving clips so the shelves are infinitely adjustable. I too the copy paper boxes, covered them in a neutral shelf / wall paper (dollar store), then labelled the boxes to store the hundreds of yards of fabric and trims that I own. Accessible and the "inventory" is used, making room for more! It is important to first declutter, give away or sell supplies for hobbies that no longer interest you and carefully organize your supplies so you can access everything. 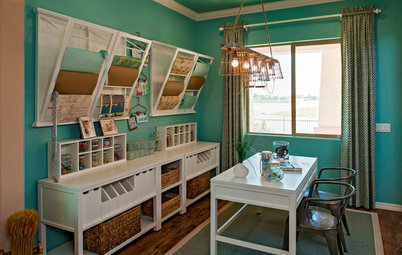 Make your creative space beautiful, accessorizing in a color you love! Add great lighting and a ceiling fan to keep you comfortable. 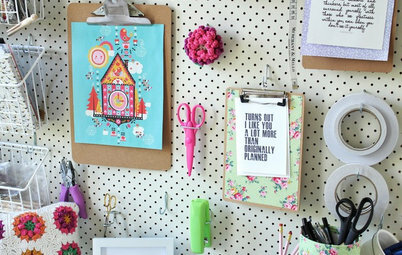 Add idea bulletin board so your space inspires you!